You are young, you are free, there’s a party this Friday like every other Friday, and you have no worry. Well, maybe just one teeny-weeny bit of worry at the back of your mind: is it time to start investing? But, it isn’t that simple! Where is that extra bit of cash to allow you the leeway to indulge in a bit of investing on the side? There’s that little irritation called the monthly rent outgo - as your job has forced you to move out of the comfort of your parents’ house and relocate to another city, and the daily expenses of living alone are not as easy on the pocket as you thought they would be. And don’t forget the car... it’s a must before you turn 26, right? But the question remains: where is the money to invest? Say you are between the age of 20 and 25 and have got a job that pays relatively well. You are eager to begin investing but have no clue how to go about it. Your first question will be how to start investing? It is not unnatural to have a relatively low amount of savings early in one’s professional life; that is nothing to despair over. Look at the brighter side: the advantage of being young is you are starting early, and small savings add up to something substantial over the years. First, make sure you enter the world of investment confidently; the Indian economy has enough reasons to make you feel so. Consulting firm PwC believes1 that India will be the largest economy in the world, after China, by 2040, fuelled mainly by higher capital investments and better technology. This means that the Indian equity market will be on a growth trajectory over an extended period – till you are about 43-48 years old, depending on your age now. So, investing in the market keeping a long-term perspective makes sense. (b) you can invest in highly liquid funds that allow you to start small and withdraw the money when you need it. Note that fixed deposits are not very liquid and may not help during emergencies. Try and figure out that from your current earnings – repeat, current earnings – how much you would be able to contribute to the short/middle term and emergency funds, and how much you can contribute towards long-term investment. Most importantly, choose an amount to invest that you’re comfortable with. One of the main reasons you may be delaying investment would be because you don’t think you have enough money to invest. “Maybe after my next salary hike”, you’ll tell yourself, assuming a higher salary would mean higher savings. But you’ll soon find that the more you earn, the more you spend. Better option? Invest small. Investing for beginners can start from as little as Rs. 1000 per month. That’s one dinner at a fancy restaurant! In a matter of 4-5 years, that money could grow to a trip to Thailand. Want to know how? Check out SIPs for Dummies. Related: Why create an emergency fund before starting to invest? Break down your goals for the next five years (the short term), and for the next ten years (the long-term), to make it easier to start focusing on funding them. These goals are not career targets, but more practical ones that require finances: for instance, buy a car in two years, get married and honeymoon abroad in the next five, etc., work out the estimates. Anything more than ten years can be allocated to Equity or (DMFs) Debt Mutual Funds (not FDs) to help accumulate the money. Here are the Types of Mutual Funds you can consider. Pro Tip: Buying a house counts as a long-term goal. Though paying rent may seem okay right now, keep in mind that spending your hard-earned money in this way gives you no returns! A house, on the other hand, is an investment. EMIs you pay to afford a home loan, are eventually going to give you an asset. While making investments is essential, there are other emergencies you need to plan for. What happens to all the money you’ve saved, if you suddenly need to spend it all on hospital bills, post an unfortunate event? Or spend it on getting your car fixed, after a massive accident? These events can’t be predicted, but they can be planned for. That’s where insurance comes in. Can you afford to live to a 100? 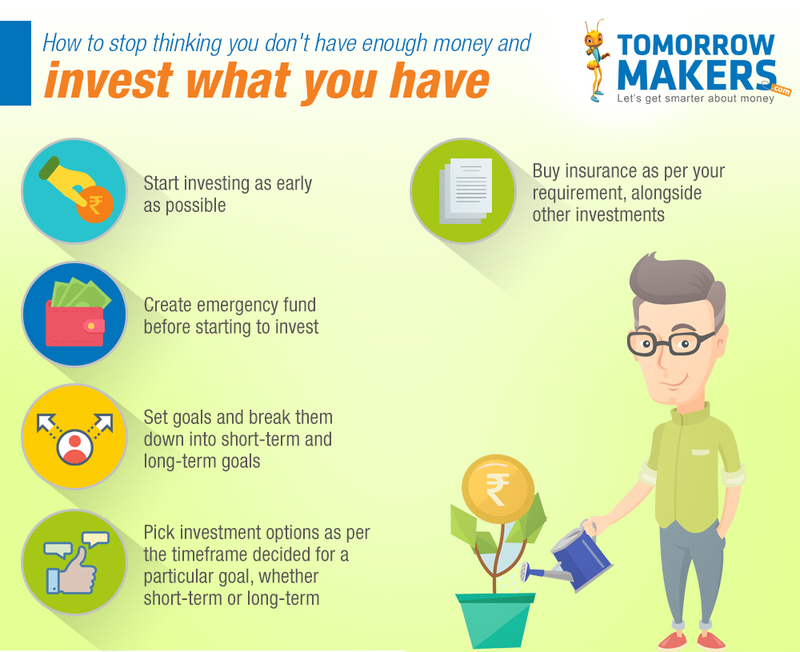 As a wrap-up word, and given that the Indian economy promises to grow in a steady upward swing, follow these tips when you think about how to start investing.